Providing more mounting flexibility than threaded track rollers, these yoke rollers can mount directly to a shaft or clevis rod. A flange keeps them aligned on the track even if they encounter side loads. They are ideal for applications where thrust loads would be too high for a needle roller bearing. 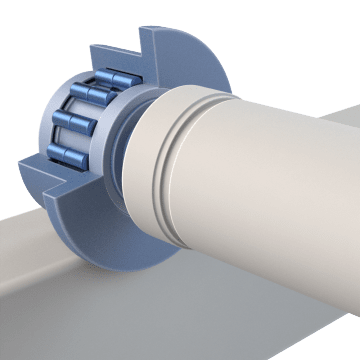 Also known as track followers, roller followers, and cam followers, track and yoke rollers consist of a sturdy wheel-like bearing with a thick outer race that rolls along flat surfaces to move a load.